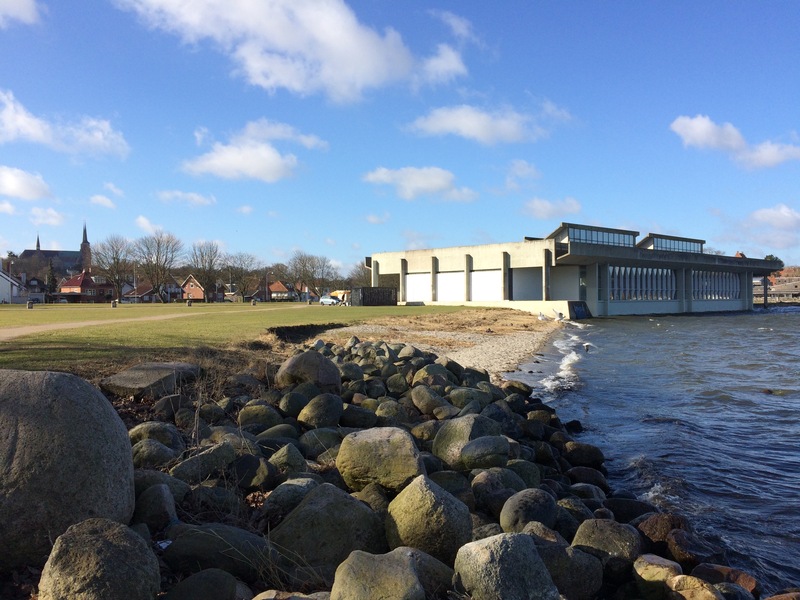 In 1962 five 11th century ships were excavated from the water at Skuldev, Denmark. The reconstruction of the 5 ships and subsequent research by Ole Crumlin-Pedersen has given archaeologists valuable insight into Viking shipbuilding and history. We now know the 5 ships were deliberately sunk in Roskilde Fjord to block a sea channel as a form of defence. 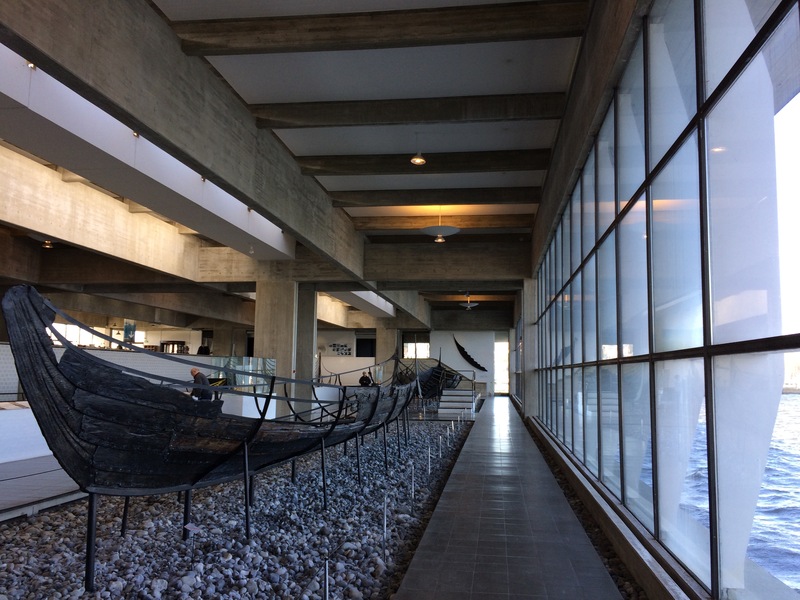 Following on from the interest in the initial discoveries the Viking Ship Hall was designed by Danish architect Erik Christian Sørensen and built in 1967-68 with the specific purpose of exhibiting the reconstructed Skuldev ships. The museum was opened in 1969 and the Vikingeskibsmuseet in Roskilde is now a centre for the study of Nordic shipbuilding and boatbuilding culture. The significance of the building is such that in 1998 the museum was the first late modern building to be listed for protection in Denmark. So added to the arguments about 20th century buildings is the museum’s coastal location and the specific vulnerability of the building (and its collection) to increased storminess and coastal sea-level rise. The building is currently subject to an International Heritage Alert from ICOMOS as following on from the 2013 flooding and the escalation of structural decay issues discussion on what to do with the building has accelerated – so much so that in August 2018 the building was delisted. As an example of the interconnected debates around 20th century building conservation, the adaptability of purpose-built structures and climate change resilience what happens to the Viking Ship Museum will be interesting to watch. 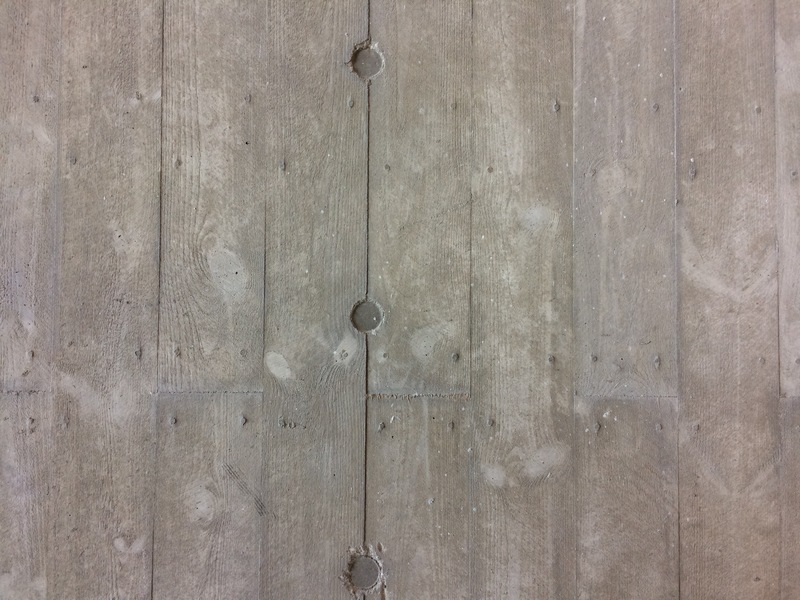 I know from my own visit to the museum in April 2018 that the collection is outstanding but the issues posed around the buildings significance (including its location, design and materials), its current condition, and the opportunities and risks it presents provides a useful example to explore debates around sustainable heritage and conservation in the 21st century. Not a question that I reflect on very often, but my situation is a broken boot, a lecture that I must give and a lecture that I would like to attend. And in itself this provides my own conservation dilemma. The sole has come away from my boot, it is hanging ‘just’ by the remaining section of the toe, as I walk the sole flips back up making the regular ‘clop clop’ of the boot more of a ‘clop woosh clop’, and I don’t have (a) a spare pair of boots with me or (b) enough time to drive home swap boots. I’m in ‘panic mode’ – a trip to the Cobbler (I am lucky that I work within walking distance) suggests this is a long repair, I can’t just walk in from the street and get this repaired. Moreover if I apply a ‘quick fix’ using super glue the cobbler won’t be able to repair the boot as at a later time they won’t be able to get in to the materials to do the repair. And so in a microcosm this presents a window into heritage conservation thinking. I’m driven by the tangible and aesthetic qualities of my boots. My boots are not just functional, they have a patina from years of wear, these are comfortable, I’ve worn them in and I like them. These were already 2nd hand when I took them over and they have already been repaired twice before. These boots have a biography. In thinking about the patina and quality of my well-loved boots I’m reminded of the conservation philosophies of John Ruskin and Alois Riegl who both noted ‘age-value’ is important in how we value monuments and buildings. So what of their repair? The quick fix using superglue would limit my future options for repair. Whilst investing in the longer repair with the skilled cobbler is a longer-time commitment. I’m going to have to plan that repair in advance (and wear different shoes in the meantime). And as an example of conservation decision making, quick, reactive fixes that limit future options have unintended consequences (I will be paying for superglue and I won’t be paying for craft skills, what will the addition of the superglue do longer term to the materials the boots are made from?). Planned interventions take longer, but will use appropriate materials and will make use of traditional skills in undertaking the repair. And so I know what I should do, I should get the repair done properly. So I make amends I tie a rubber band around the boot – if I can keep going today then I can get the boot repaired properly in the future. As William Morris says through the SPAB manifesto I am ‘propping a perilous wall’ and I am going to invest in the proper repair with the cobbler. 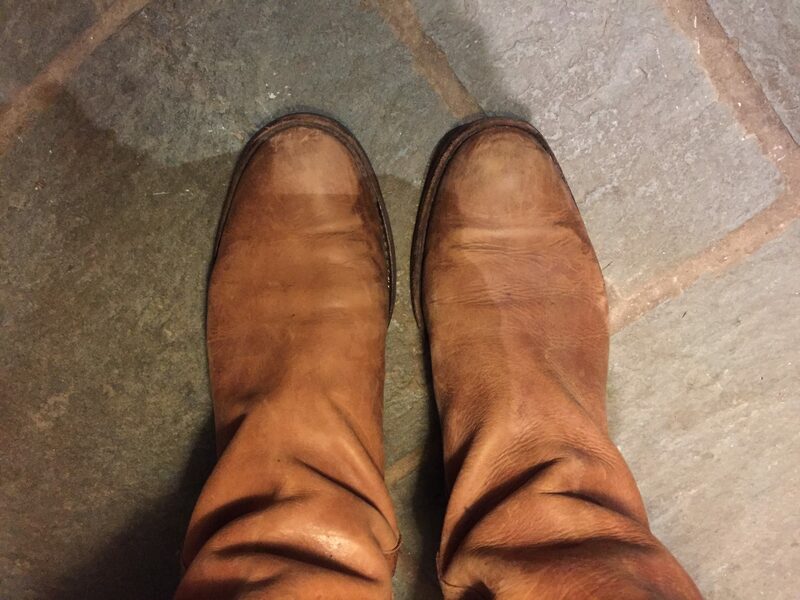 I am also avoiding puddles as unintended water ingress in my damaged boot might result in a much more complex repair. I’m also making this conservation dilemma a social process, I’m seeking advice from colleagues, students and friends. I’m also wondering if I had maintained and monitored the condition of the boot I might I spotted signs of its poor condition. I’m also bemused that if I had followed best conservation practice around Disaster Risk Preparedness I would have an emergency pair of boots with me, and a plan for ‘what if’. I also know retaining and extending the life of my damaged boot is going to be a better option for the environment as well. And so it is just a boot but the dilemmas posed can be modelled back to the decision making in heritage conservation. We know that all buildings do need a good hat (roof) and a good pair of boots (foundations) in order to survive and I like to think William Morris would have adapted in this situation with an equally stylish rubber band around his boots. One of the joys of picking up novels is finding buildings, and stories of their construction and maintenance. One of my childhood favourites is the opening of Wind in the Willows where Mole is Spring-cleaning and whitewashing his home on the river bank. 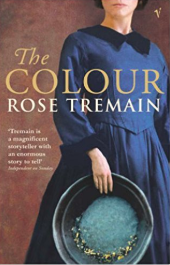 I’ve just found another building gem in ‘the colour’ by Rose Tremain. In ‘the colour’ a newly married English couple Joseph and Harriet Blackstone emigrate to New Zealand in the mid 19th century and in establishing a new life in a new country build a new cottage of Cob. The couple try to farm harsh land near Christchurch, but the house is built on the wrong site, in the wrong place, and by the husband and local labourers – rather than by the husband and wife in partnership. The cob building acts as a metaphor for a failing relationship in a harsh country. As the building self-destructs in extreme weather so does the relationship between Joseph and Harriet – and this provides the substance of the novel. Whilst I love finding interesting buildings in novels this is another example of how earth buildings have been used as a symbol for failed relationships and harsh lives. This is perhaps most famously by Woody Guthrie in House of Earth (in this earlier blog post). A brief search of the New Zealand Heritage Lists shows a wide range of colonial earth buildings – cob, adobe, sod, rammed earth – all legacies of a colonial era and reflecting local vernacular materials and styles executed in New Zealand, as homesteads, agricultural buildings, missionary and church buildings (amongst others). The survival of these buildings and structures is in contrast to the perception of earth as an ‘unconservable’ building material of last resort. In the 21st century like Earth Building UK and Ireland EBUKI – New Zealand has an Earth Building Organisation http://www.earthbuilding.org.nz/ and a range of earth building standards for contemporary construction. A quick google shows a range of contemporary constructions in New Zealand – all rather aspirational and in contrast to the metaphorically hopeless Cob house of ‘The Colour’. 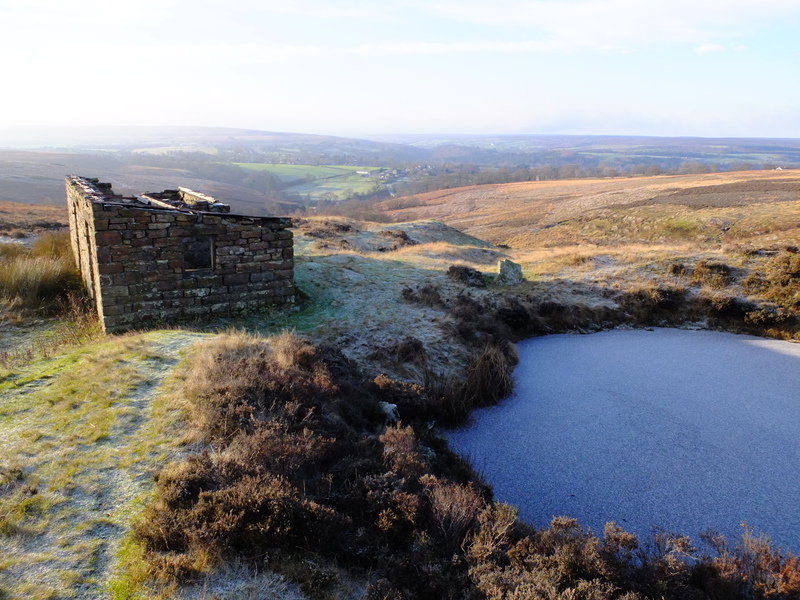 For the last 31 months (or since April 2014) I’ve been working for the North York Moors National Park on the development of the This Exploited Land HLF Landscape Partnership Scheme. In the time I’ve been working on this project my blog fell quiet – but the National Park conservation blog was regularly updated with highlights from the project – of which there were many. 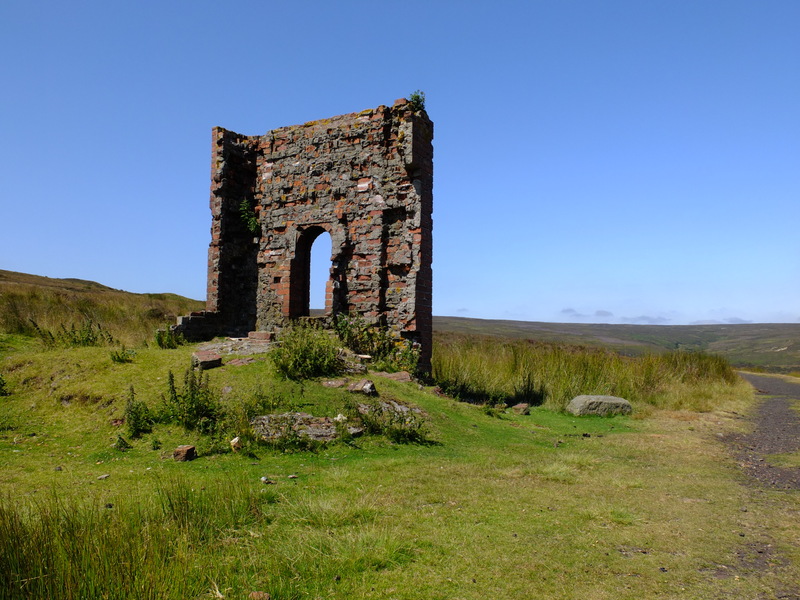 When I joined the project it was focused primarily on the physical remains associated with a century of ironstone exploitation from the 1820s through to 1920s – and so through the development of the scheme I developed a ‘before, during and after’ narrative to contextualise the physical remains and extend the project from an archaeological focus to a broader, heritage landscape focus. 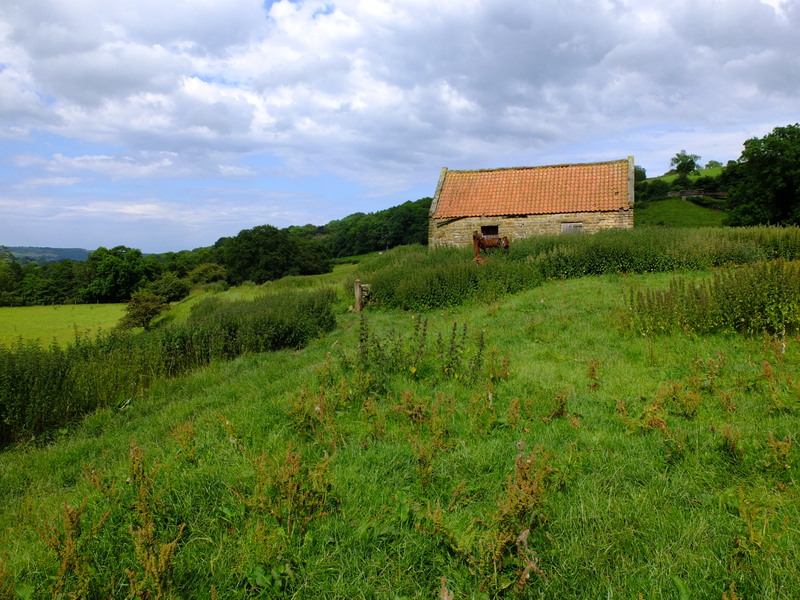 Alongside the stories of how the landscape has been used, it also contains amazing stories of people who lived and worked in the landscape in the past and those who value and use the landscape today. The landscape and the exploitation of its mineral wealth is also interwoven with a number of famous and influential lives, including Gertrude Bell. In many ways the rural industrial landscapes remind me of the distinctiveness of earthen cultural landscapes (characterised by upstanding ruins in ’empty’ places) and so switching from the very ‘old’ archaeological sites of Central Asia, Middle East or South America through to much more modern landscapes in the UK was an easy transition. The conservation problems are similar, so the methods and approaches that can be applied are remarkably similar but are applied to different materials and from different time periods. I’m now handing on the reigns to a new project team who I hope will share my delight and passion for the former industrial landscapes of the North York Moors. In the meantime I’m returning to more teaching and more freelancing.